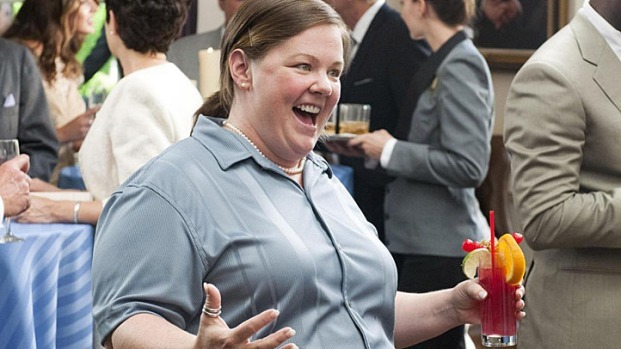 Melissa McCarthy's coming out party continues to rage on. McCarthy and her husband/writing partner, Ben Falcone, are int talks to sell their script, "Tammy," to New Line, reported Variety. The film follows a woman as she learns her hubbie's been cheating on her, and loses her gig at Hardee's, inspiring her to hit the road with her granny. In case you missed it, that was Falcone playing the air marshal that McCarthy's character eventually beds during the closing credits of "Bridesmaids" (we weren't able to eat a sandwich for a month). But McCarthy's breakout performance was only the beginning, as she went on to win an Emmy for her role on "Mike & Molly." We'll confess to having previously found McCarthy little more than annoying. As "Gilmore Girl" fans from way back, we always considered her Sookie a nuisance--what she delivered in "Bridesmaids" caught us totally off guard. Going in we figured she'd be the weak link--man were we wrong. Melissa McCarthy's "Huge Dream" To Host "Saturday Night Live"
At "The Help" premiere, Melissa McCarthy tells how "overwhelming" it feels to be asked to host "Saturday Night Live." So, how did she react when she first found out?